The Alpha Magnetic Spectrometer-2 (AMS) is seen in space shuttle Endeavour's payload bay. 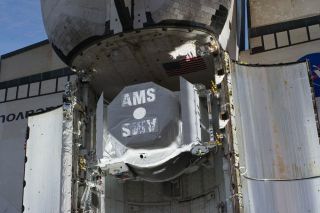 Shortly after this image was taken, the AMS was moved from the payload bay to the station's starboard truss on May 19, 2011 (Flight Day 4). A team of astronauts, including retired spaceman Mark Kelly and his wife, former Congresswoman Gabrielle Giffords, toured a European physics lab today (July 25) to mark the first birthday of the International Space Station's most expensive, ambitious science experiment. The particle detector was launched on the space shuttle Endeavour's STS-134 mission, the second-to-last flight of the 30-year shuttle program. It was installed on the International Space Station on May 19, 2011 and began operations a short time later. "The AMS detector has so far achieved everything we expected of it," Nobel laureate and AMS principal investigator Samuel Ting said in a statement. "That's a great credit to the team that put the detector together, and the team that installed it on the ISS. We're honored to have them here today to celebrate AMS's fist year in space." "It's a real privilege to visit CERN today, and we're proud to have played a part in launching the AMS experiment's fascinating research program," Kelly said. "Meeting some of the young summer students who represent the future of science and engineering was a highlight." Kelly was accompanied on the visit by his wife, Congresswoman Gabrielle Giffords of Arizona, the Associated Press reported. Giffords is making her first trip abroad after suffering a gunshot wound to the head in a mass shooting last year. Giffords did not speak publicly, but Kelly told the Associated Press, "She's doing great, she's doing great. She's just here to support me." During AMS' first year in space, physicists have been using its initial data to calibrate the detector and better understand the extreme space environment in which it functions on the exterior of the space station. The machine has already detected hordes of particles, including some types never seen in nature before. "Among AMS's achievements is that for the first time, we've been able to identify electrons with energies exceeding 1 TeV before they enter the atmosphere," Ting said. "This holds out great promise for the AMS research program that's now getting underway."